With Mother's Day almost here, 'My Mother's Kitchen' is the perfect read. Here, six notable Kiwi foodies share the nostalgic recipe that reminds them of Mum. "I’ve been quoted before saying that Mum’s corned beef pie would be my death-row meal. Mum is fantastic with pastry and I’ve always used her half-butter, half-lard pastry recipe when I cook, including in my restaurants. For many years I’ve wanted to recreate the whole pie, but I’ve never dared, so I’m using this opportunity to pay homage to it." "My introduction to the kitchen, like a lot of other kids, was helping my mum make cakes and getting to lick the bowlIsraeli food has become less Ashkenazi and more Sephardic and Arabic over the years, but the European krantz is the nation’s favourite cake, so the recipe has hung on. It has layers of thin brioche style dough spread with chocolate. It’s what everyone eats with their tea or coffee, and what you bring as a gift when invited to someone’s house for coffee. In Israel you can buy it in every bakery, so Mum didn’t actually need to make it too often, but for us this is the cake, so here is the recipe." "In France it’s common to eat this brioche tart warm as an after-school snack, le goûter. My grandmother lived in Brittany, and I only saw her during the school holidays, so that’s when she would make it for me. I’m looking forward to making it for my little one." "Mum fed our family generously with humble ingredients and always pulled out the slow cooker to cook a traditional English mutton or lamb for our Christmas dinner. I learned to cook mutton with a Middle Eastern flair in my first role as a chef and tested this recipe out at home on Mum. Cooking it low and slow and using these flavours makes the less popular but underrated mutton bloody fantastic, and pays tribute to Mum’s one-pot wonder mentality." "I grew up near Naples and as a child this dish was the only dish I really wanted to eat. Luckily for my mother, it’s simple to make, so she made it for me all the time – I can honestly say I grew up on spaghetti, tomatoes, basil, and garlic. I have made one tweak to my mother’s traditional recipe, which she doesn’t approve of. I am a technologist, and I know that cooked pasta is water-based, and when you pair it with an oil-based sauce the sauce naturally wants to slide away. I add a little bit of lecithin, an emulsifier, to the sauce. Now the sauce is attracted to and clings to the pasta, and this actually gives you even more flavour in every mouthful." This is an extract from My Mother's Kitchen. To learn more, see here. 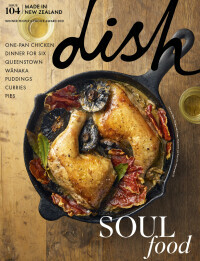 In this book an extremely impressive line-up of over 70 New Zealand chefs, cooks, bakers, writers and foodies share the stories and recipes from their own mother’s kitchen, the food that they remember and which triggers all the best memories of early family life. Published by Potton & Burton, $49.99.